Number 6023 'King Edward II' getting ready to depart Kidderminster. A shortish note only this month to update you with some Club developments, advise you of some forthcoming events and let you know about a Swansea Private-Owner van commission which will be on sale at our 2018 show. But first, best wishes to Gwynn Jones following his very recent hip operation – we look forward to seeing you on your return Gwynn and hope that all is going well. The revamp plan for the Test tracks was covered fully in the March Newsletter but updates were promised and here is the first one…. Anyone who has visited the club over the past few days will have seen the destruction wrought by Mal Rowe and his team of vandals! The tracks have been lifted [and a great deal salvaged], the old boards are no more and work is now underway to level and reinforce the main supporting structure. The worst of the really messy work is near completion but it is still very much ‘work in progress’ and so do be aware [and be careful] that tools, cut timber and wiring will be around for a while to come. Mal is hoping that the work on the framing will be completed in the near future and work can then commence on painting and laying the new boards. You’ll notice also that the framing has now been cut to allow for a lifting section to ease entrance into the centre well of the tracks. And remember, to make the best use of the new facility, all of the track will have dual-use capability: analogue and DCC. Volunteers to assist with the later painting tasks are very much welcome – please talk to Mal directly. Many thanks go out too to Mal’s team for their work to date. Stock is sold as seen but described honestly. Stock is sold on a first-come-first-served basis. Stock cannot be reserved in advance. As mentioned before, the sale includes a good Hornby BR A4, an unused Hornby Class 56, a good Dapol N gauge GWR Pannier Tank, a Farish N gauge GWR Railcar [first type] and several American HO diesels [diesels approx..£10 each]. This lot is now augmented by some BR rolling stock [Bachmann] and some Bachmann steam locos. There may also be some Lima diesels by the time of the sale. A reminder again that on Thursday the 12th. April, Terry McCarthy will be visiting the Club to give a talk on Coal and the Railways of South Wales. The talk starts at 7pm in the old Chapel on Floor One. Admission will be free and Terry may be able to return later in the year to provide another talk. Please do support this event: Terry has an excellent reputation as a speaker on these topics and the presentation is bound to be interesting. Guests are welcome. Incidentally, on Saturday the 14th April [2-5pm], Terry will also be speaking on the The Vale of Neath Railway’s Dare-Amman Branch at the Clayton Hotel, Cardiff CF10 1GD [Meeting Room 7]. This is a Welsh Railways Research Circle event [the Club is a member]. The most successful event to date, the competition saw a total of 19 entries covering a wide range of subjects. A full write-up appears in the Blog section of our website, where there are also photographs of the entries. Congratulations go to First Prize winners Simon Durrer, Ian Stevenson, Alan Burton and David Lane and also Robert Allender who won the Chairman’s Cup. See the website for more! Last month’s report brings the Show details pretty much up to date although Scott Rhodes is still looking to book further exhibition layouts. Scott has asked that I remind all members that he is seeking volunteers to assist with marshalling, etc., at the show. Please respond positively to this request and either speak to Scott personally or put your names down on the sheet on the exhibition notice board. Have a look at the recent updates which include reports on the 2018 modelling competition [as mentioned above] and a photographic record of the Club’s trip to the Severn Valley Railway. Over the long weekend on the 26th – 28th May, The Gwili Railway is holding a Craft Fair at which we shall possibly have a table to promote the Club and sell our limited edition ‘Tirdonkin’ wagons. The Gwili will also be running steam that weekend – see Richard Grigg or Mike Sarsfield for details. All will know that Wagon-Meister Blows is taking a well-earned rest and will not be commissioning any further stock on behalf of the club during 2018. Burnham Model Railway Club is however and its private-owner team will shortly be releasing a van in the livery of the long-defunct Swansea United Breweries. This will be on sale soon but will also be available at the team’s stand in our 2018 show. All of the profits from the sale of this commission will be very kindly donated to FOYD – for which, many thanks Burnham. I will try to acquire an image of the van for the next newsletter. I’m told that this livery has not been released before. In the meantime, Swansea United Breweries had an address in Orange Street, Swansea, at one time. One of the many now lost Swansea street names, I was curious to find out exactly where it was. 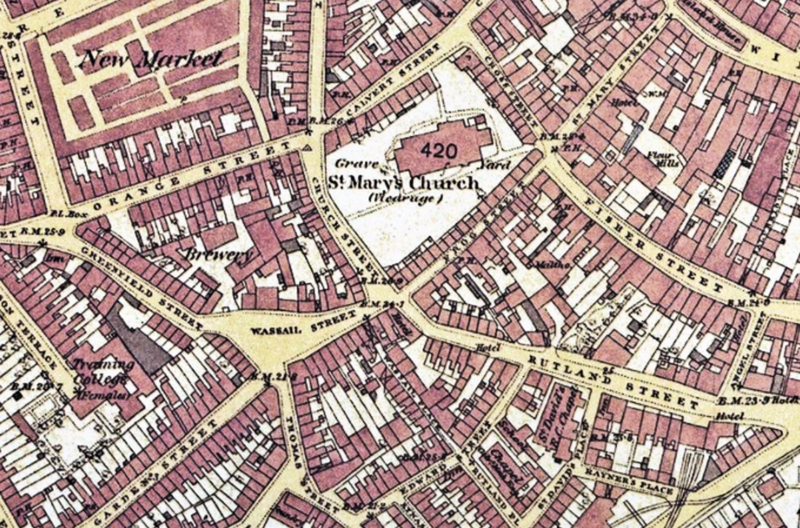 I found the attached map on-line which shows not only Orange Street but also the brewery [to the left of St Mary’s Church]. The image [probably Ordnance Survey] was not credited unfortunately, and so is used with many thanks but without acknowledgement. This has now become the subject of regular complaint because of the state in which it is permanently left. Effectively half of the worktops are unusable because of clutter and sometimes even more space is taken-up. The room has been cleaned up by a Committee member on many previous occasions but that person’s goodwill seems to be taken for granted and is, effectively, ignored. The room is not ideal: it is small and quite cramped, but it is the only dedicated modelling space available within the Club and, consequently, it must be kept in a tidy and proper state. Soldering and the assembly of [for eg] etched brass kits cannot take place anywhere else. From Thursday the 19th. April, everything that has been left out, unattended, will risk being disposed of without further notice. To avoid the loss of personal items, please put them away / take them home or discuss with Scott Rhodes / Tony Richards the possibility of them remaining as work in progress [but stored more conveniently]. All tools and electrical equipment are subject to this requirement also. We should all recognise the frustration caused to those who wish to use the room for modelling but are unable to do so currently. Thank you all. There is also an event in Port Talbot on the 14th. April. This includes model railways but also buses, military and aircraft models. Apart from the venue, I have no further details of this event [St. Agnes’ Church, Forge Road, PORT TALBOT, SA13 1US].